Express your everlasting sentiments to your sweetheart with this cool new Parisian Love Padlock and Key. According to tales from Paris, couples in love would place a lock on part of a bridge to symbolize their unbreakable bond and everlasting love. 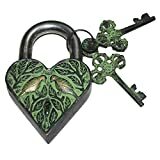 Each working, heart-shaped padlock is crafted from antiqued cast iron and includes a matching key, a story card explaining the Parisian tradition, and a handcrafted wooden crate. 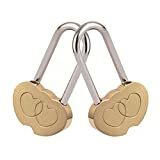 A unique way to show your beloved that he or she has the key to your heart.